No one ever said success had to be born from an original idea. Sometimes, imitation works just fine. 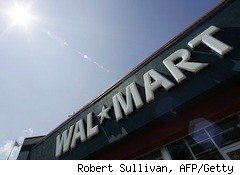 Whether that turns out to be true for Walmart, which has launched a deal of the day program similar to Groupon, only time will tell. Called CrowdSaver, the first deal launched this week on the retailer's Facebook page. If enough people "like" the deal, then it's on. Currently, CrowdSaver is offering a 42" plasma TV for $398, an 18% savings, according to Walmart. Shoppers who buy into the deal are directed to print a certificate, redeemable at Walmart stores at a later date. There are restrictions, including only one unit per person, the item is only available online at Walmart.com and only while supplies last. The CrowdSaver price is only available if the required number of "like" votes is met. This threshold of required votes may vary for each CrowdSaver item. This is a great way for Walmart to unload sales items and drive traffic to its website. And who can blame them for copying Groupon's model? After all, Walmart is hardly the first to do so. Sites like LivingSocial, Buy With Me and Woot all jumped on the social buying bandwagon. The more deals, the better for consumers. It's also in Walmart's nature to try and make a successful marketing program its own. When Netflix launched to near instant success, Walmart was quick to implement its own DVD rental by mail service. It ultimately ceded the business to Netflix, however, and actually sent its customers to that once rival business. It recently bought Vudu's on demand movie business, again looking for a foothold in the streaming video market that Netflix already dominates. For now CrowdSaver is a deal, a $100 off a TV deal. Just click "like."